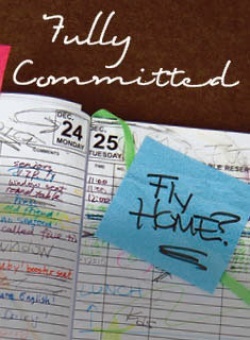 New Repertory Theatre offers an inside look at the workings of a trendy New York restaurant when it presents Becky Mode’s wry comedy, "Fully Committed," December 19 - 30 in the Black Box Theater at the Arsenal Center for the Arts, 321 Arsenal Street in Watertown. "Fully Committed" was named one of Time Magazine’s Top-Ten plays of 2000. Directed by New Rep's Associate Artistic Director Bridget Kathleen O’Leary, the one-man "Fully Committed" features Gabriel Kuttner as Sam, an actor-slash-reservation clerk at a 4-star Manhattan restaurant who is just trying to get home to the Midwest for the holidays. For tickets and information, stop by the box office, call 617-923-8487 or visit www.newrep.org.